In order to ensure personnel, equipment and environment safety during the sulfur-containing oil-and-gas-field exploitation, development and production process, safety measures have been heavily invested for construction teams. The fixed hydrogen sulfide detector is one of the measures. Its probe is usually installed at the drill entrance, drill platform, vibrating screen, mud circulating tank, and other areas where hydrogen sulfide can easily leak out and gather. It is for the purpose of realizing all-weather continuous monitoring of the hydrogen sulfide concentration, which can prevent poisoning of the hydrogen sulfide and ensure production safety. In order to help onsite personnel to discover problems with the detector at an earlier date, ATO technicians have analyzed commonly-seen faults and their causes according to years of experience, hoping that the analysis can ensure timely onsite processing and accurate maintenance. The phenomenon happens mainly because the probe model and the main engine model are inconsistent with each other or indication drifting and circuit fault caused by expiration and damage of the probe. A method to cope with this problem is to first check consistency between the probe model and the main engine model according to the user manual and ensure conformity among different parts. After that, check the production date of the probe. Generally, the probe designed for the sensor can serve for two years. If the probe has been expired, please immediately change for a new one. Then, open the probe cover to check whether the probe has water. This can ensure a normal work environment for the probe. Finally, check the circuit to see whether the circuit wiring has problems. Pay special attention to whether the inlet and outlet of the probe are inversely connected. Since the fixed hydrogen sulfide gas detector is mainly distributed at the drill entrance, drilling platform, vibrating screen, and mud circulating tank, its appearance and gas explosion-proof membrane might be easily contaminated by the drill liquid and mud. Particularly, the probe of the drill entrance can be easily contaminated by the mud and sewage left by construction. The probe installed at the drilling platform and in the open air might easily get its explosion-proof membrane wet by the rainwater. The above causes can easily cause a huge indication error. Meanwhile, if the probe is not effectively calibrated for a long time, the sensitivity of the sensor in the probe might be greatly impaired, making it impossible to accurately measure the gas concentration of the hydrogen sulfide. A method to cope with this problem is to frequently check the usage of the probe, periodically remove the monitor probe, clean the explosion-proof membrane, clean the sensor, and ensure smoothness of the gas channel. If the probe is installed in the open air, the rain-proof devices should be installed. If the probe is working in a hydrogen sulfide environment for a long time, the sensitivity of the sensor, after reacting with the hydrogen sulfide might be largely weakened. 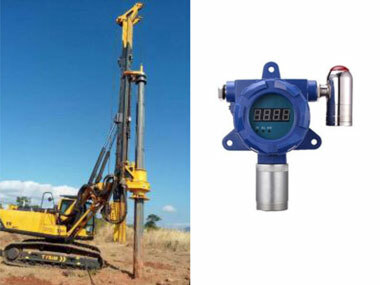 Under the condition, the user should immediately send the sensor to the professional department for calibration. When the hydrogen sulfide is smelled onsite, or the simplified hydrogen sulfide gas detector detects the hydrogen sulfide, while there is no indication on the gas detector. This is probably caused by the full blockage of major sensor’s explosion-proof membrane. As a result, the gas cannot reach the gas. Or the sensor might become invalid, leading to a paralytic state of the system. If the sensor's explosion-proof membrane is contaminated by the drill liquid or blocked by other pollutants, open the cover, take down the probe and the metal explosion-proof membrane, and soak the filtering membrane in the clean water added with a little detergent for half an hour. Brush over the drill liquid and pollutants on the explosion-proof membrane. After that, use the pliers to clamp the explosion-proof slice. Repeatedly blow and wash the filtering membrane using the high-pressure air rifle. Adjust the high-pressure gases in an ascending order according to the gas pressure. Repeat the above step for multiple cleaning until the filtering membrane is clean and smooth. Finally, dry the cleaned filtering membrane, and install the explosion-proof membrane and probe after drying.